We couldn't have asked for a better "almost one-year anniversary" present than this Big Fat Blog Award! 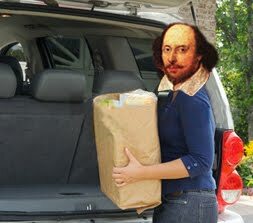 That's right--everydayshakespeare has been named one of 24 important Shakespeare blogs by onlinecollegesanduniversities.com! And they (according to judgespot.com) are themselves "a tiny bit popular." So let's give it up for the tiny guy! p.s. Shakespeare had to buy his family's coat of arms. We got ours for free. I think he'd be proud, don't you? I was just observing to Dianne this morning what a pleasing word "armigerous" is. Congratulations! You are now my favorite armigerous blog.